Some people go on vacation to see amazing natural wonders. Some people go on vacation to experience new cultures and meet new people. However, everyone eats while on vacation. Fortunately, in Niagara Falls, there’s something for every kind of traveler — especially the food-loving kind. Because Niagara Falls is an amazing place for agriculture, renowned chefs flock to the region for the opportunity to work with some of the freshest, highest quality ingredients in the world. As a result, even the cheapest restaurants in Niagara boast delicious grub. If you are looking to pig out on your trip to the falls, this guide should help you find the absolute best spots. It’s hard to imagine a place where you can enjoy a one-of-a-kind world wonder and eat as much fresh, wonderful food as you want — but Fallsview Buffet Restaurant is that place, and it definitely exists. Located in Sheraton On The Falls, the buffet provides views of all three of Niagara’s waterfalls as well as a significant amount of the Niagara countryside. Plus, Fallsview offers an 80-foot buffet, filled with live-action cooking stations. You can dine here for any meal and find something different and delicious, making it an excellent stop during a busy day of seeing (and tasting) Niagara. Easily one of Canada’s most notable chefs, Jamie Kennedy gives Niagara visitors more than edible treats in his restaurant Windows. Through the eatery’s eponymous floor-to-ceiling glass, you can view a panorama of Niagara. Featuring an up-close scene of Horseshoe Falls as well as a peak at American and Bridal Falls, the restaurant certainly provides some of the best views in the region. Furthermore, the food has won several awards from Canadian and International agencies, so you know you’re eating a high-class meal. Another Canada native, Massimo Capra has earned his name as a world leader in Italian cuisine. His Niagara flagship, the Rainbow Room, is located high in the Crowne Plaza Hotel — a resort that is already highly regarded for its room views. 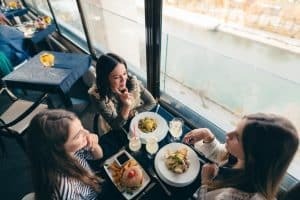 North of the falls, the restaurant overlooks a swath of the Niagara River as well as both sets of falls, and visitors can enjoy the Niagara skyline while they dine, too. Because Chef Capra calls Ontario home, his food uses some of the freshest ingredients in Canada, ensuring your meal is local, unique, and delectable. Looming at 775 feet from base to tip, Skylon Tower provides some of the best birds-eye views in the region; the only way you can get higher is by taking flight. You can visit the Tower nearly any time of day, morning, noon, and night, and purchase tickets to the observation deck — or you can reserve a spot in Skylon’s Dining Room and enjoy a meal and a view all at once. Skylon’s menu rivals the complexity and artistry of the best restaurants in the area — including Kennedy’s and Capra’s. It is your responsibility to remember to eat when you are so busy soaking up Skylon’s spectacular panoramas. Most other Niagara restaurants are situated high-up for outstanding scenery; meanwhile, AG Inspired Cuisine is located in the basement. Still, AG doesn’t have the views of the previous four dining options, but it certainly offers a competitive menu. Boasting some of the first true farm-to-table food in Niagara, AG is both a farm and a restaurant catering to those with exquisite taste. Undoubtedly, your trip to Niagara Falls will include at least one winery tour. If you are smart, you will schedule some time at Trius Winery at Hillebrand, which is one of the first, the largest, and the best vineyards in the Niagara valley. 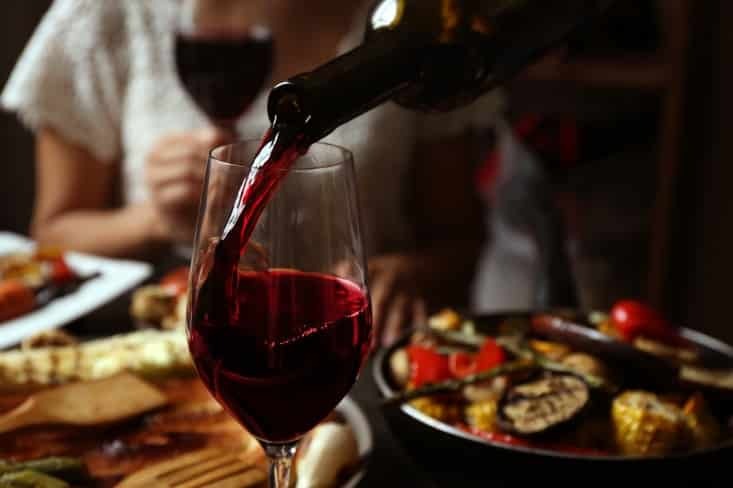 Not only does Trius boast some of the most noteworthy distinctions for its vintages, it also offers a top-tier restaurant that will pair its famous wines with outstanding food. It’s important to eat while you are tasting wines — so why shouldn’t you eat some high-quality cuisine? Mild, temperate Niagara Falls might be the last place you would expect to find exotic Asian cuisine, but Mai Thai offers such sumptuous plates, you definitely shouldn’t balk. Authentic Thai food is spicy, sweet, and savory. It might be a welcome departure from the sophisticated salmon and lamb dishes at other Niagara foodie spots. Perhaps the best purely Italian restaurant in the Niagara region — considering Capra’s Rainbow Room is a mixture of European culinary styles — Napoli Ristorante Pizzeria is warm and welcoming. With a motto of “He who eats well lives well,” the pizzeria offers high-class Italian comfort food, including goat cheese ravioli, Portobello pizza, and house-made meatballs. If you didn’t drink enough at Trius, Two Sisters Vineyards beckons with more delicious wine and food. Kitchen 76 offers an approachable menu that uses ingredients from the surrounding Niagara countryside to craft dishes that perfectly complement its signature wines.